Frankie Firme was born in East Los Angeles, and grew up in the 1950’s-60’s. His parents were ” Pachuco Jitter Buggers” from the 1940’s, and exposed Frankie to music and dancing at an early age. Growing up and coming of age in Los Angeles in the 1960’s, Frankie was exposed to numerous social changes, including the Civil Rights movement and Chicano Anti War Moratorium, as well as American music development, which included the birth of the MOTOWN, STAX-VOLT, FANIA, BRITISH INVASION, and the early English language Chicano West Coast “EAST SIDE SOUND” rock & roll (post Richie Valens, Chris Montez, Lalo Guerrero, et al) and early HARD ROCK (Jimi Hendrix, Janis Joplin, Buddy Miles, et al) music genres, along with 1940’s Big Band and traditional Spanish language Mariachi music from his Los Angeles Mexican-American family roots. His older brothers introduced him to Doo-Wop ballads as a way to get close to girls. During High School, Frankie was the guy who collected 45 records, played them at garage parties, and made 8-track and cassette music tapes for neighborhood friends. While serving overseas with the Marines during Viet Nam, Frankie made friends with other Marines from across the Country, who exposed him to Tejano, Salsa, Hard Rock, East Coast and Miami flavored Latin Soul and Afro-Cuban rock music, as well as Country & Western, “Delta Blues”, Funk, and “The Philly Sound”…all good!….but his first love remained the Oldies but Goodies and Blues. After the Marines, Frankie attended college, graduated, and began a 40 year career as a Mental Health Nurse, but his love of music and music collecting remained. As a side job & hobby, Frankie had short stints as a nightclub bouncer and stage security guard for music shows, then became a nightclub and private party mobile DJ, before getting his first radio gig in Hollywood at KCLA FM in 1999, joining Dean Lewis’s “Kaleidescope Radio” program format , which was experimenting with (then) new broadcast format venues on the West Coast called cable radio, satellite radio, and Internet Radio. On a dare, Frankie developed his “Frankie Firme” radio personality style modeled after TV’s Saturday Night Live’s “Father Guido Sarducci”, appearing on stage strutting in a Zoot Suit, wide brimmed hat with sunglasses, and projecting a cool, lowriding/cruising attitude while introducing his music, as well as live music groups during his first live show in 1999 at the famed Hollywood Race Track & Casino in Inglewood, California, featuring The Olympics, Al Wilson, Rosie & The Originals, Trish Peeler, and the Coasters…and a “Star was born!”. 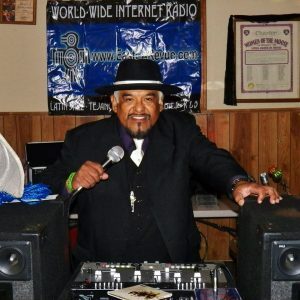 As Internet Radio began to grow with the affordability & access to computers with sound, along with lap tops, I-Pods, smart phones, and WiFi, Frankie had short stints on other Internet radio Stations such as Q-Vo Radio, Lost Memories Radio, and Texas’s pioneer Internet Radio Station ChicanoExpress.com , established and hosted by TV/Radio Personality “CrazyChuy” Hernandez, known as The “Godfather of Chicano & Tejano Music” who also flaunted the Pachuco Zoot Suit style .